Please join us Thurs. Oct. 26, 6-8 pm, for our Designers Celebrate the Arts benefit - an evening to honor creativity and collaboration, and to support the Cultural Alliance. Enjoy cocktails, appetizers, and music, mix and mingle, and be inspired! Co-chaired by Lynn Morgan and Patrick Mele, the event is hosted by The Antique and Artisan Gallery, Stamford. Ceramicist Frances Palmer will introduce DJ Carey, Editorial Director, C&G Media Group, in recognition of her work in support of the design community. $40. Tickets here. Videos are now posted from our successful ARTISTS TALK at Ridgefield Guild of Artists, from its 40th Annual Juried Show, Oct. 1. See our Artists Talk page here, or connect directly to the videos of Nancy Moore (1st Prize), Cindi Mullins (2nd Prize), Polly Castor (Honorable Mention), and Shelley Lowell (featured guest). You can subscribe to our YouTube channel here. Next Artists Talk, Sun. Nov. 5, at Flinn Gallery, Of Art & Craft, with Susan Eisen, Norma Minkowitz, and Ellen Schiffman. Tracey Anderson-Kollar is a partner with Susan Taylor Murray in Finished With Style, a company that has now been creating custom decorative finishes on walls, floors, ceilings and furniture in residential and commercial spaces throughout Connecticut and New York since 2001. Tracey believes her "obsession with all things vintage" goes back to growing up in an 1850’s farmhouse, where she remembers stripping her bedroom’s pine floor of paint at the age of 15 and decorating her room with her first "vintage" finds: an old metal bed frame, painted white, and an antique rug purchased for $30! She also remembers being a featured painter in her first-grade art festival, teaching summer arts & crafts for her town’s recreational program and enjoyed the full range of art classes through high school. Tracey studied Graphic Design at Endicott College where she got an A.S., and the University of Bridgeport where she received her B.S. in Graphic Design. She then worked in the field of visual merchandising and retail management, specializing in home furnishings, accents and interior design. See the Finished With Style website, Facebook page and Instagram page. Many might describe Polly Castor as a force of nature. She describes herself as "a Christian Science practitioner, an artist, a photographer, a poet, a veteran homeschooling mother, a wife, a cook, a thought leader, a traveler, a nature lover, a reader, a peacemaker, and a former Structural Engineer." Polly has painted, taken photographs, and written poetry from her youth, and says she loved Kandinsky since before she could walk. For her, the arts are a form of meditation: "a time of connecting with what is both beyond me and essentially me, an exploration within." 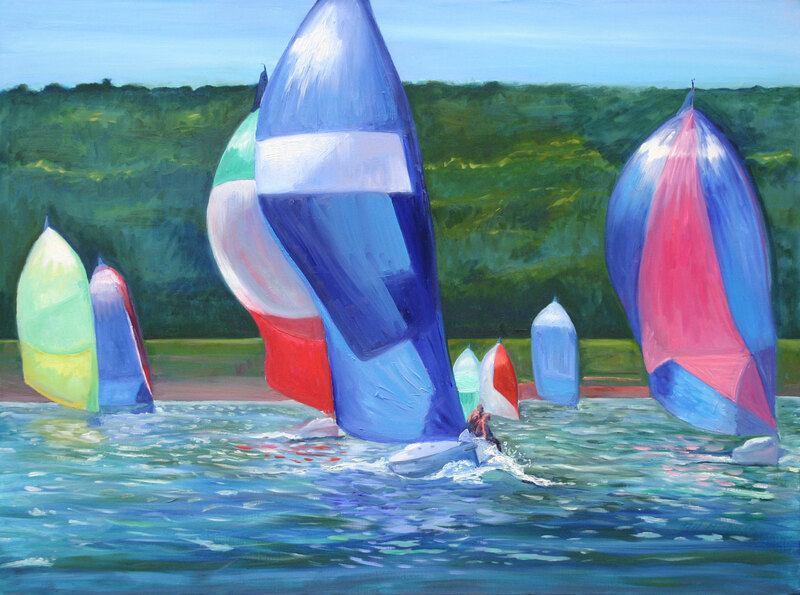 With her painting, she says she particularly "resonates with color and landscape." Her images are both representational and abstract, using a range of mediums, mostly pastel, oil, watercolor, acrylic, and gouache, but she also works with collage, multimedia, printmaking, handmade glass beads, knitting, needlepoint and pottery. Perhaps most interesting is Polly’s pursuit of what she calls Abstract Conceptualism: painting non-material or unseen ideas: such as confidence, or the month of July. She writes that whereas abstract expressionism "lets whatever you are feeling rip on the canvas unexamined, abstract conceptualism strives more to dispassionately communicate concepts." She believes the mix of metaphysical abstract thought, together with the process of objectifying these non-material thoughts in a way they can be shared with others, is a very healing process both for the artist and the viewer. See examples here. Polly is a dedicated blog writer. Her blog is almost universal in its coverage and she has been writing consistently and regularly since 2009. Polly recently won a cash award in her first national juried show: Pastel Renaissance 2017, 24th Annual National Exhibit (Oct 4 - Nov 4). 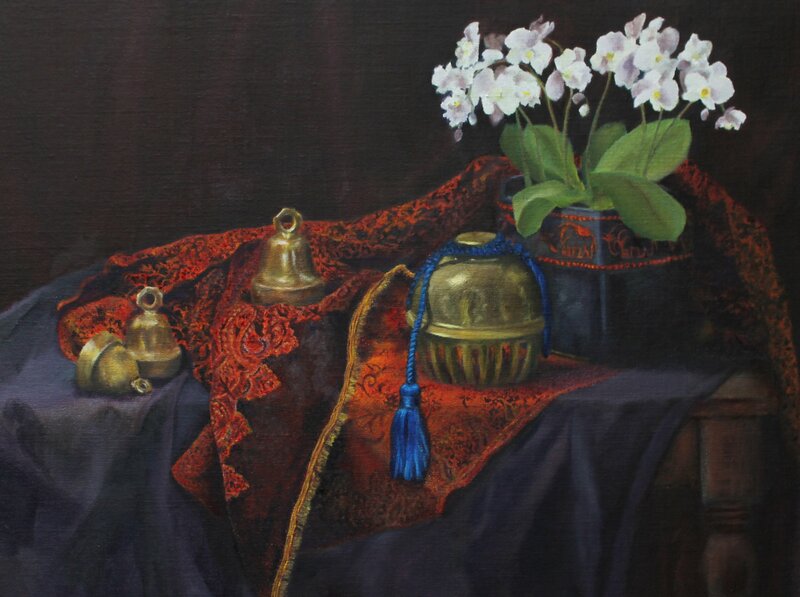 She is a member of the Ridgefield Guild of Artists, recently won an Honorable Mention in its 40th Annual Juried Show, and you can see her Artists Talk here. See her website, Instagram and Facebook pages and Twitter feed. Heidi Lewis Coleman and Gwen Hendrix had work accepted into SPUN, an international innovative fiber art exhibition, held at The NEST Arts Factory, and juried by Jeff Mueller, gallery director at Silvermine Arts Center. The opening reception for the exhibit is Sat. Oct. 14, 2-5pm, during the NEST's Open Studios event. Carlos Davilà, Jane Davilà and Peggy Weis are in a three-person exhibition, Shape Form Pattern at Fairfield Library’s Bruce S. Kershner Gallery. The opening reception is on Sat. Oct.14, 4:30-6:30pm, with an artists' talk at 5:15pm. The show runs through Dec. 4. Paul Berger, Nancy Breakstone, Miggs Burroughs, Linn Cassetta, Dawn Dahl, Eugenie Diserio, Ellen Gould, Len Grayeck, Ruth Kalla Ungerer, Joanie Landau,	Carole McClintock, Day Moore, Susan Murray,	Melissa Orme, Al Coyote	Weiner and Jarvis Wilcox all have work in the Pequot Library's 10th Annual Juried Exhibition, The Story of Art, opening Sat. Oct 14, 5-9pm. 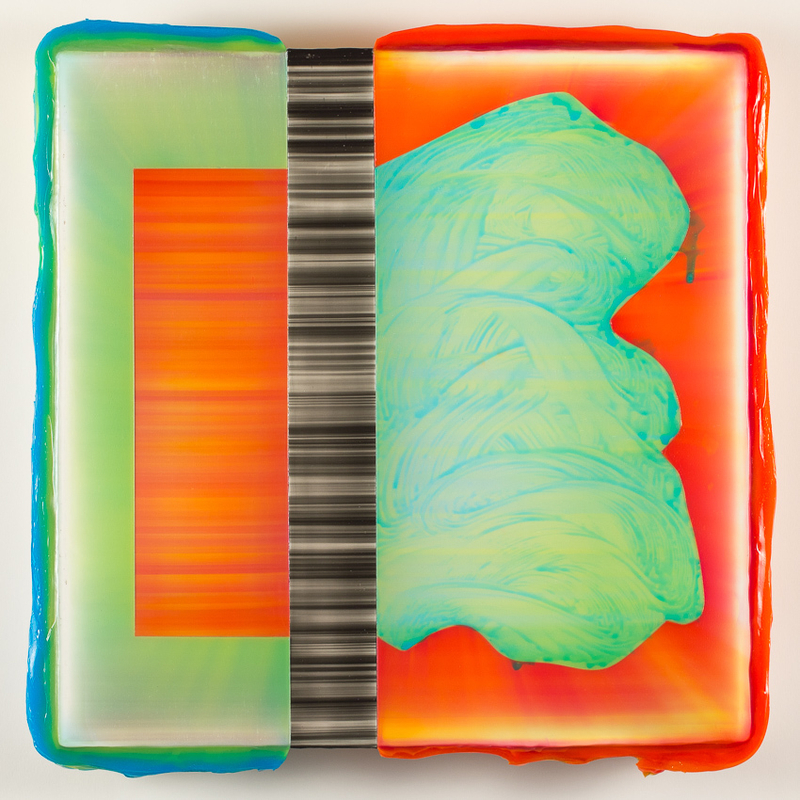 Joseph Fucigna and Amy Vensel have work included in Align-able Angles (degrees of points of view), a show of artists that use abstract language and formal structure in an unusual vision. Works selected demonstrate the pervasive use of unusual fabricated elements and everyday objects in the artworks that has a long standing tradition that dates back past to the turn of the century. Opening reception, Fri. Oct. 20, 5-7:30pm. Miggs Burroughs, Linn Cassetta, David Dunlop, Veronica Hofstetter, Sholeh Janati, Paul Larsen, Emily Hamilton Laux, Julie Leff, Cindy Mullins, Dale Najarian, Juliette Tehrani and Jahmane West all have work in the Designers Celebrate the Arts Fundraiser at the Stamford Antique and Artisan Gallery, 69 Jefferson Street Stamford, on Thurs. Oct. 26, 6-8 pm. Tickets and information here. Miggs Burroughs has four of his lenticular pieces in the Pequot Library's The Story of Art exhibit opening Sat. Oct. 14, 5-9pm. At right, Firehouse (16x20") that depicts the old Fairfield Firehouse on Reef Road transforming into the Firehouse Deli at the same address today. Click for the full effect! Linn Cassetta has her Frozen Eggs (2016, black-and-white photography, detail at right) in the Pequot Library's The Story of Art exhibit opening Sat. Oct. 14, 5-9pm. Linn comments: "An egg is Nature’s most perfect form. A magical object, it represents beginnings, hope, and perpetuity….. simultaneously strong and fragile. This is an old egg, floating to the top of water then frozen in time. Old eggs float, new eggs sink and touch the bottom. There is a message there." Heidi Lewis Coleman is showing two pieces in SPUN 2017, opening Sat. Oct 14, 2-5pm at The NEST: Cornhusk Weaving I (1998, acrylic on woven paper, 36x36") and Lichen Glyphs (1999, acrylic on woven paper, 36x36," at right). Both are part of Heidi's woven paper series. By shredding two similar paintings horizontally and vertically, she weaves and reassembles a picture which appears to ripple and vibrate. The patterns she uses contribute additional dimensions of texture and movement. Dawn Dahl is showing her Bells, Bells, Bells (2017, oil on birch, (27x31") in the Pequot Library's The Story of Art exhibit opening Sat. Oct. 14, 5-9pm. Dawn comments: "I thought of the Gilded Age fascination with Orientalism and Japonisme. The 'exotic' in a time of Colonialism influenced so many different forms of art. Political actions of the century that followed have created a very different world today, with equally serious social problems. And Orientalism has become a sociologically freighted term, either dismissive or implying cultural misappropriation. How limiting that is for the Western artist who simply wishes to express beauty, as I have endeavored to do with Bells, Bells, Bells (Or is this my own thin gold gilding?)" Joseph Dermody has donated three sets of two paintings to three nonprofits. Joseph painted them all together to help fund raise for each organization. He says the energy and movement in each painting represents the momentum to help sustain these organizations, while the color palette provides inspiration and healing. Each nonprofit received two paintings (two halves of a single concept), one to be auctioned and one for sale. At right Painting One (2017, 36x36"), one of the two donated for Arts Alive! the Sat. Oct 14 benefit gala of the Greenwich Arts Council. Others were donated to Greenwich Breast Cancer Alliance and the Triangle Community Center. Eugenio Diserio's Bold As Love (2017, acrylic on canvas, 36x48" detail at right) was selected for the Pequot Library's The Story of Art exhibit opening Sat. Oct. 14, 5-9pm. About this, Eugenio wrote that it was inspired by the sudden death from cardiac arrest of her sister-in-law. Her son, terrified that something like this would happen to her, sent her images of his own beating heart, which inspired her to paint. Working with a very saturated palette she wanted it to feel organic as well as high tech, like the Heartbeat image her son sent and the sounds of the machines that briefly supported Jill. Carol Nipomnich Dixon's mixed media embroidered collage Mythical Bird can be seen at Art Angels in the NAWA Gallery, 315 West 39th Street, Suite 508, New York, through Oct. 26, 2017, with a reception Thurs. Oct. 19, 6-9 pm. Carol’s art is 6” in diameter, created this year, using embroidery thread and Caran d”Ache on Felt. Her colorful abstract bird may be detected among imaginary foliage and flowers. Philip Eliasoph is celebrating the publication of his book Adolf Dehn: Midcentury Manhattan, with a reception, book signing and discussion Sat. Oct. 28, at its gallery in Building 13 on the Mass MoCA campus (1327 Mass MoCA Way, North Adams). Philip will discuss "Why Midcentury Masters Matter," and on show in the gallery will be: Adolf Dehn’s Manhattan: People, Places, Spaces. Kat Evans is one of six Abstract Women, in the show by that name opening at Southport Galleries, Fri. Oct. 20, 5-8pm. Kat's is one of six quite different independent abstract visions in the show. At right her Color Awakenings XII (2017, acrylic on canvas collage, 36x36"). There is a visual vibration of the red-orange against green. Christa Forrest has a solo show, Works of Peace and Spirituality, at The NEST Arts Factory, curated by NEST artist Patrice Barrett. When painting landscapes, Christa uses color as a map and foundation and works primarily in pastels and oil. In her Goddess series, Christa asks, “what defines her?” Where do her strengths emerge? What inspires her to be the Goddess she is? At right, Crystal (2017, acrylic mixed media on wood panel, 11x14"). The show opens Sat. Oct. 14, 2-5 pm and runs through Nov. 4. Ellen Gould has a photographic pentaptych taken with her iPhone in the Pequot Library's The Story of Art, opening Sat. Oct 14, 5-9pm. Richard’s Sunday Comics (detail from one of the five panels at right) shows how the iPhone is a great tool for capturing spontaneous moments that make wonderful memories. Ellen writes: "The light on this particular Sunday day was perfect for humorous portraiture. This pentaptych was assembled from a series of 38 iPhotos taken on one Sunday at our favorite Sunday luncheon spot. It is part of a larger series called So Done!" 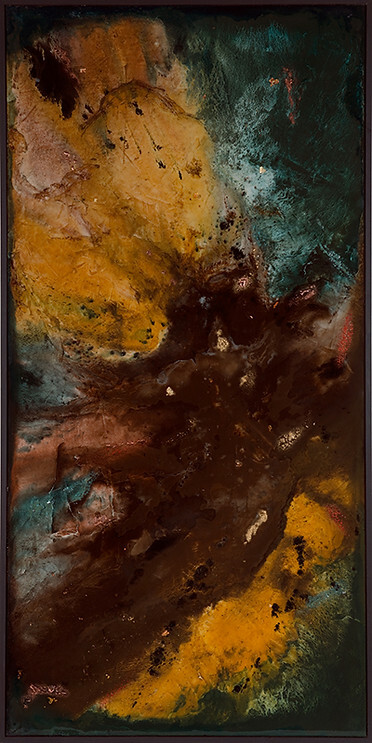 Gwen Hendrix has her Descent (2017, textile pigment on encaustiflex, mounted on wood panel, 15x15x1.5” at right) juried into SPUN, opening at The NEST, Sat Oct 15, 2-5pm. About this work, Gwen says "Floating, transparent shapes of circles, squares and checkerboards create a tidal pool effect, pulling the viewer to descend into the work." Joanie Landau has her spectacular piece State of Becoming (2017, digital collagraph, printed on archival ink jet paper, face mounted to 1/4" plexiglass, 30x30") on display at the Pequot Library's Story of Art, through Oct. 22. Part of her “Sticker Shock” series, Joanie writes: "A recent day in Brooklyn revealed messages of all kinds: serious political directives, memorandums to higher beings, and declarations of love inter-connected in a menagerie of communication. This piece is inspired by Bob Dylan's words from No Direction Home: 'An artist has to be careful never to really arrive at a place where he thinks he’s at somewhere. You always have to realize that you’re constantly in a state of becoming, and as long as you’re in that realm, you’ll sort of be all right.'" Jane Lubin will have several pieces at CWOS in New Haven during Erector Square Weekend, Oct. 28-29. At right, Mao & Marilyn, Smoking (2016, collage, 10" x 10") from her Cigarette Pack Collage series is on view now at Artspace New Haven, through Nov. 12. Another piece from this series, Pow Wow, will be on display at the Erector Square Artist Studios (315 Peck Street). More information here. Allyson Monson has photographs from her Splat series in the Carriage Barn's Art for Alz show (through Oct. 22), and from her Blur series, Allyson has Coming Down, (2016, black-and-white photograph, various editions and sizes, detail at right) at 25 Under 26, at Elisa Contemporary Art Salon, through Dec. 14. Day Moore has one of her new pieces from her series Surfacing in the Pequot Library's Story of Art exhibit, opening Sat. Oct 14, 5-9pm. 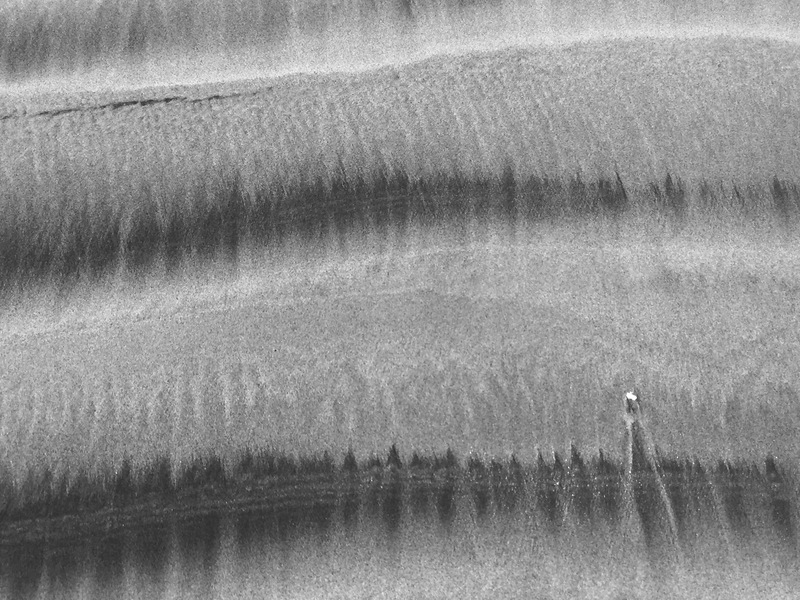 Day's new work continues her ongoing colloquy with the sea: "exploring the idea of abstracted perception through photos taken while ascending to the surface of the water. Using a GoProHero to photograph the underside of the 'skin of the sea,' then heading into the studio to paint the results. Under the sea, looking up, once familiar images become otherworldly and unrecognizable at the whim of current or wind. Fractured, shattered and reconfigured: Is it an overturned life raft, contents spilling out, or a placid, idyllic beach replete with coconut palms." At right Bodega (2017, oil on board, 45x45"). Day notes she continues to donate a percentage of all sales to Sea Shepard Conservation Society. Susan Murray is displaying her piece Earth Nebula II (2017, mixed media on hard board, 36x24", detail at right) in the Pequot Library's Story of Art exhibit, opening Sat. Oct 14, 5-9pm. Susan writes: "After a lengthy preparation of the surface, Susan applies suspensions and dispersion pigments, paints, acrylics and water. With a torch, she fires these elements until they fight with each other and create the most beautiful, one of a kind, counteractions. A truly magical process!" 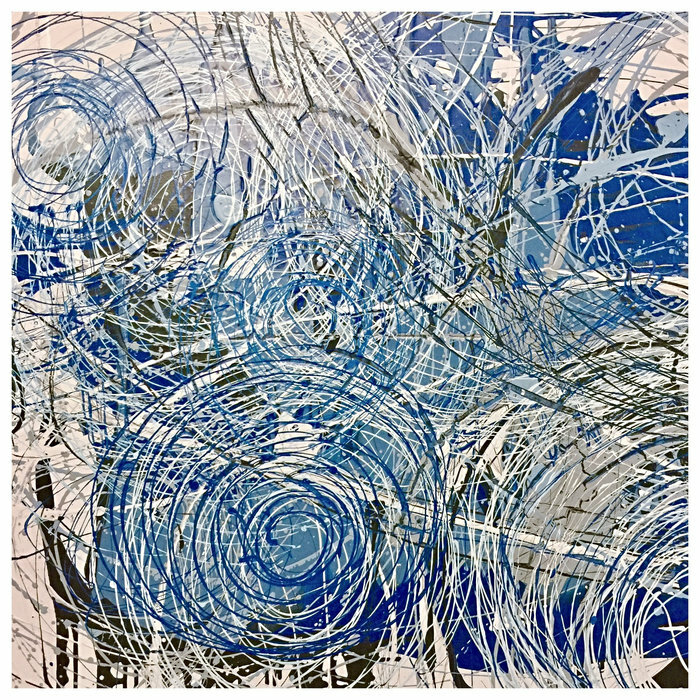 Jill Nichols has a solo show, Flying Colors at the UConn Health building, in the Celeste LeWitt Gallery, Food Court, 263 Farmington Avenue, Farmington (see news story). At right is a detail of Flying Colors (Oil On Canvas, 36" x 48"). Rick Shaefer is in good company, exhibiting two of his pieces with work by Kiki Smith, Andrea Rosen, Walton Ford, Shelly Reed, Andy Warhol in Touchstones, Totems, Talismans: Animals in Contemporary Art, which opened Fri. Oct. 13 at the Brattleboro Museum and Art Center, Brattleboro, VT, through Feb. 11, 2018. 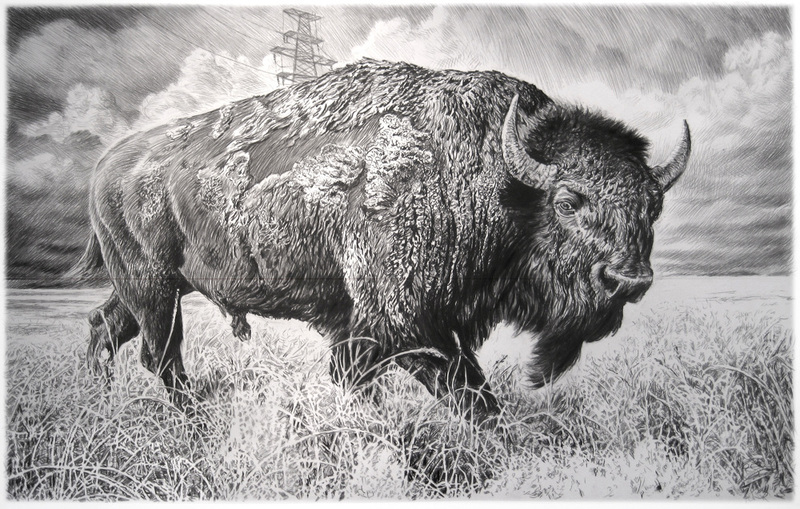 Rick is showing Dodo II (2017, charcoal on vellum mounted on paper, 45x45") and Bison IV. Amy Vensel has several paintings, including Risp (2017, acrylic on canvas, 16x16", at right) in Align-able Angles (degrees of points of view), opening at the University of Bridgeport's Schelfhaudt Gallery, Fri. Oct 20, 5-7:30pm. Al Coyote Weiner has two pieces in the Pequot Library's Story of Art exhibit, opening Sat. Oct 14, 5-9pm, Schmutz and Tibet (2017, acrylic on canvas, 48" x 32" detail at right). It's his interpretation of Tibet, with the towering peaks of the Himalayas. Sat. Oct. 14: Julie Leff, Weston Arts Studio Tour, 10am-5pm. Sat. Oct. 14: Christa Forrest, Works of Peace and Spirituality. Opening Reception, 2-5pm, The NEST Arts Factory. Sat. Oct. 14: Shape, Form, Pattern. Kershner Gallery at Fairfield Public Library. Opening Reception and Artists Talks, 4:30-6:30pm (Carlos Davilà, Jane Davilà and Peggy Weis). Thurs. Oct. 26: Designers Celebrate the Arts. Fundraiser, 6-8pm. Stamford Antique and Artisan Gallery, 69 Jefferson St, Stamford. (Miggs Burroughs, Linn Cassetta, David Dunlop, Veronica Hofstetter, Sholeh Janati, Paul Larsen, Emily Hamilton Laux, Julie Leff, Cindy Mullins, Dale Najarian, Juliette Tehrani and Jahmane West).